Video can be a valuable tool if it is used appropriately. Search the internet and you will quickly find many videos of your favorite track — some more useful than others. 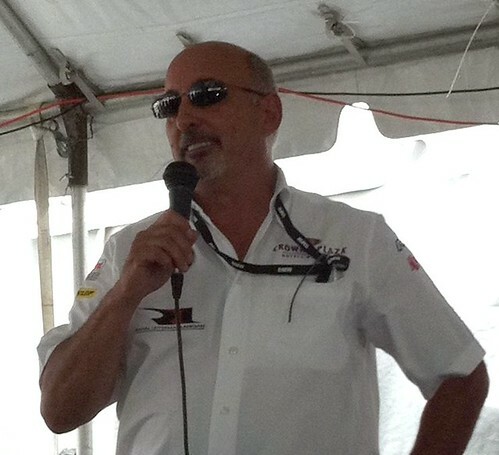 The good ones can help you learn the line before you drive the track for the first time. Others are intended merely to show the world that you drove on the track. If that’s all you want out of video, then stop reading, this article isn’t for you. This article is about learning from your videos. So let’s build up to it, starting with camera placement and then talk about data analysis. Before you place a camera on your car, think about what you want to get out of it and what restrictions there might be that limit your options. Do you just want to show your friends the track? Do you want to learn the line? Do you want to see how close your wheels really are to the apex on certain corners? Do you want to record what happens in front of you? 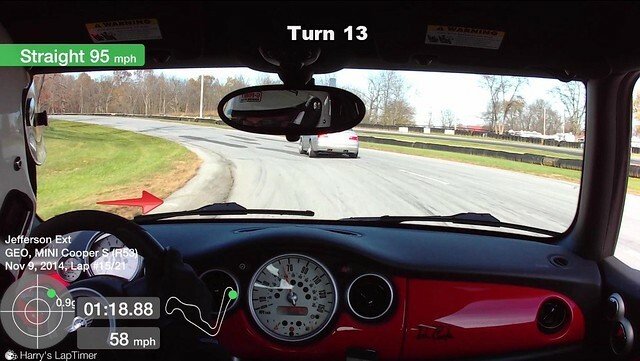 Or do you want to see your inputs as you drive around the track? Those decisions will help guide camera placement. Compare the views from the two videos below. The first one is mounted inside on the front windshield (old, non-HD camera) and the second (iPod 4G) is positioned behind the driver. 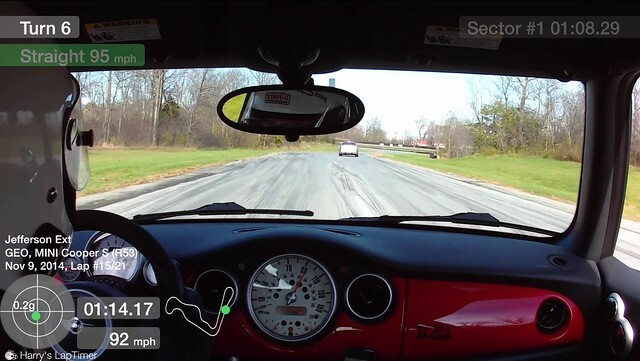 Driving through some fluid, understeer quickly becomes oversteer (and oversteer again). How did the driver? You cannot tell from this view. 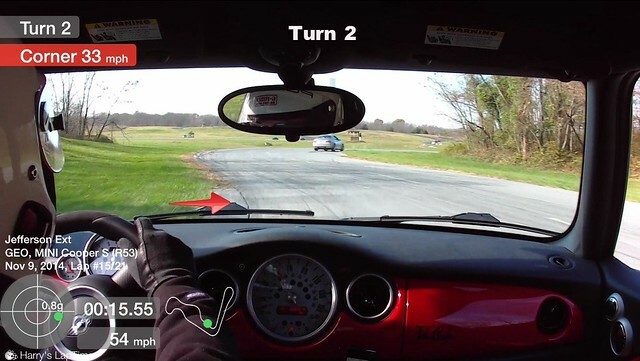 In this second video, we see the driver quickly catch the over-steer and accelerate out of the corner, showing the importance of quick hands. Camera Position and Live Timing. 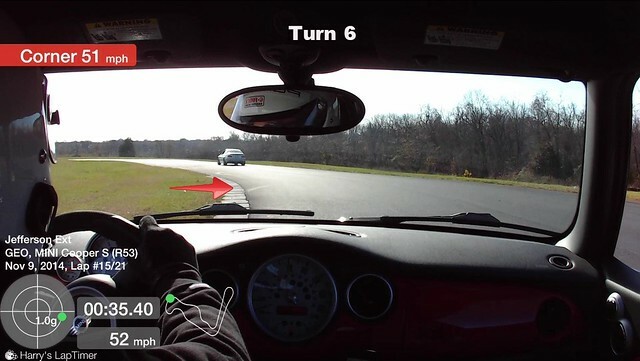 Most High Performance Driver Education (HPDE) events run by car clubs have rules against live timing. You will need to position any recording or timing device in the car in such a way that it does not give live feedback to the driver. For external cameras, many clubs restrict the use of suction mounts, requiring a hard mount. Check with your club before you buy. Even if suction mounts are allowed, be sure it can withstand the wind and vibration of being driven at speed. Position the camera so it does not impede the driver’s vision and locate it in a place that it is visible to the driver directly or in a mirror. Never consider externally mounting a camera you aren’t willing to sacrifice to the Goddess of Speed. Low positions such on tow hooks are visually interesting, but not very helpful for learning. Better is mounting on the roof along the center-line of the vehicle, above the interior mirror with a view of the front hood and fenders. This will show car placement on the track and traffic directly ahead. 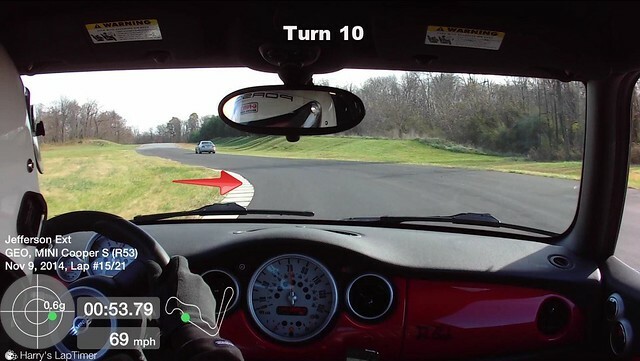 This placement creates a video that is a good tool to show general car placement, learn a track, and to film following a car directly in front of you. Because it does not capture driver inputs, it is not our preferred placement. If your camera is light and small enough (Replay XD 1080 Mini for example) consider using a suction mount to place it on the windshield inside of the car and tether it to the mount for the passenger visor. For cars without rollbars, this is often your best option. It offers a similar view as on the roof and the camera is protected from the elements. 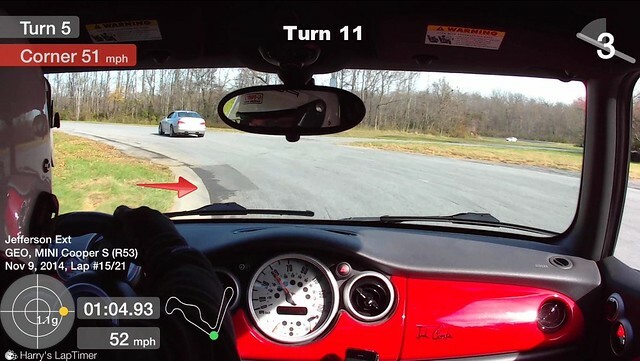 It can easily be controlled by the instructor from the passenger seat. We’ll start out on the Summit Point Main Circuit. Same Lap with Data Overlay. By adding telemetry data from Harry’s LapTimer and data from PLXdevices Kiwi 2, now we start to get a feel for use of throttle, corner speed, lateral forces, and gear selection. Same Lap with Camera Behind Driver. 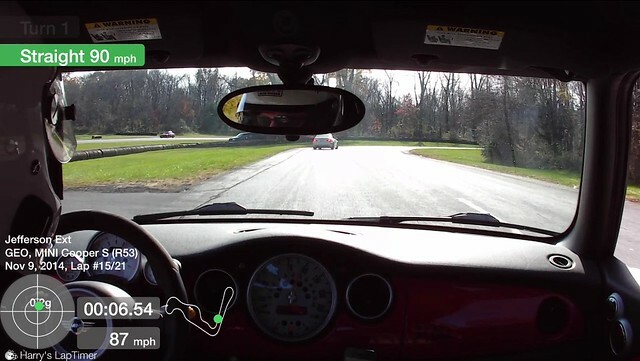 In this video, we’re using an iPhone 5S in an Optrix XD5 Case mounted to our rollbar. 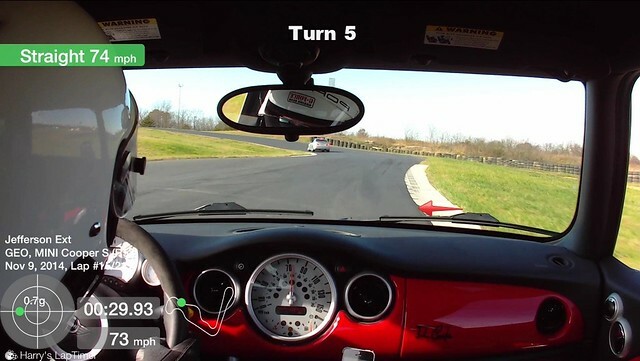 By mounting the camera behind the driver, now we start to get a feel for driver input. Is the driver struggling to maintain position because the seats are not supportive. Is the driver looking into the corners? How are the driver’s hands on the wheel? If you don’t have a rollbar or harness bar, you can get a similar view using a head-rest mount such as the CruiseCam Mount. That second camera could be showing a view back toward the driver from the front, it could be showing feet on the pedals, or it could be a reference lap to compare one lap (or driver) to another. You are really only limited by your imagination (and equipment). In Part 1, we discussed camera placement and capturing data. 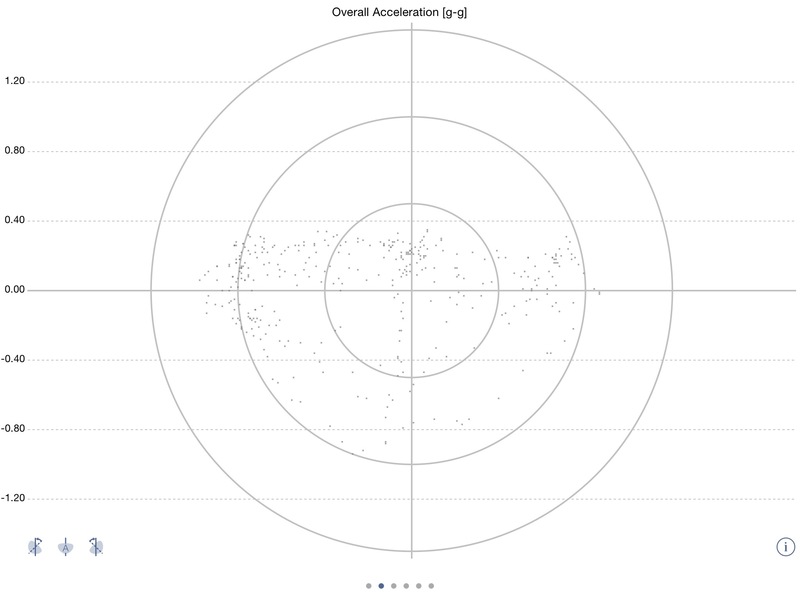 In this post we’ll explore what we can learn from the data we’ve captured. 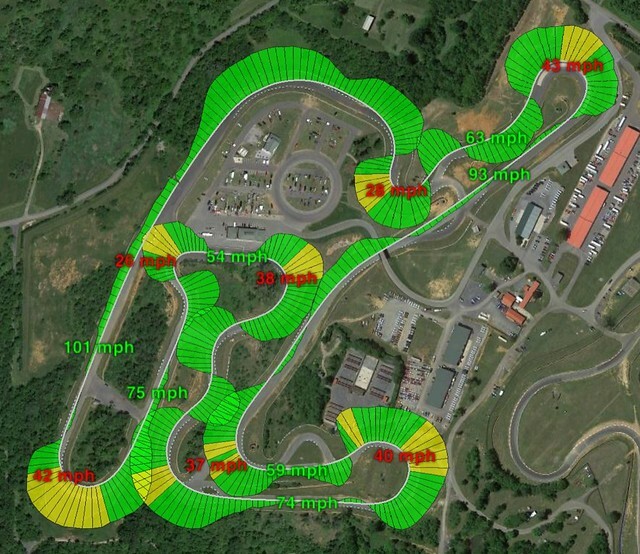 The track this time is the Shenandoah Circuit at Summit Point Motorsports Park. 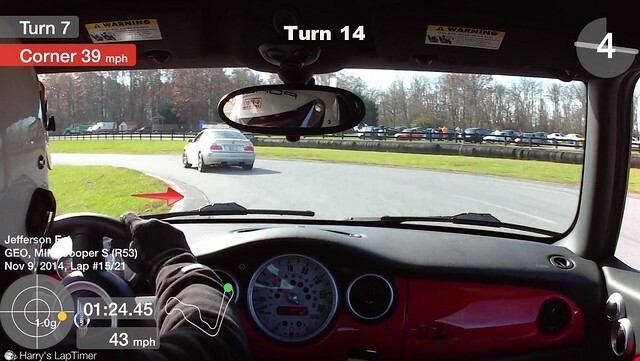 This is a challenging 2.2 mile, 22 corner road-course used primarily for driver’s education events that features a dimensional replica of the Nürburgring-Nordschleife’s banked Karussell turn complete with 20 degrees of banking (but without the Graffiti). Video was captured on a Replay XD MINI 1080 mounted on my rollbar; data was provided by a PLX Devices Kiwi WIFI; positioning was provided by a Dual AV XGPS; and timing came from Harry’s Laptimer (HLT) on my iPhone. The video was edited in Quicktime and later added to the HLT dataset on my iPad. 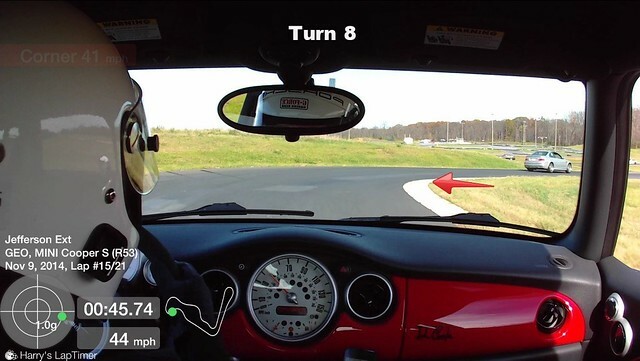 In this post, we’re going to focus on an examination of cornering speeds. This post isn’t about outright best lap times, rather improving driver smoothness and carrying as much speed as possible through the corners. Lap time is just one of many ways to measure performance. Using data from HLT that was exported to Google Earth, we can plot cornering speeds and lateral G-forces over the track-map. We’ll compare the two laps of this weekend to the reference lap of 2:01 (fastest lap last year in R-comp tires in this car). The color bars are supposed to represent the direction and intensity of the G-forces: Green is 0.4 – 1.0 G; Yellow is 1.0 – 1.25 G and Red is greater than 1.25 G. Our goal for the weekend was to see how close we could come to this level of performance using street tires. Here’s the lap we’re trying to analyze, 2:06.75. Let’s try to find where we’re losing almost two seconds. 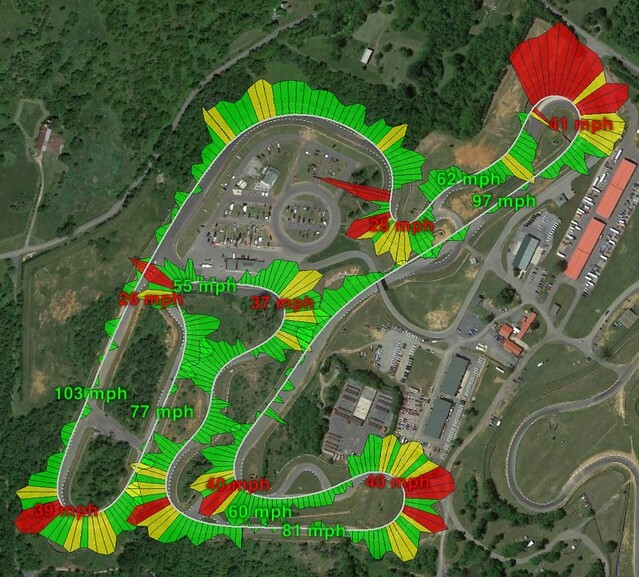 Lower apex speeds mean lower exit speeds, leading to lower top speed at the end of the next straight. We know that we can’t expect the same level of grip from these street tires that we got with the R-Comps, so let’s look where we might make up some speed. 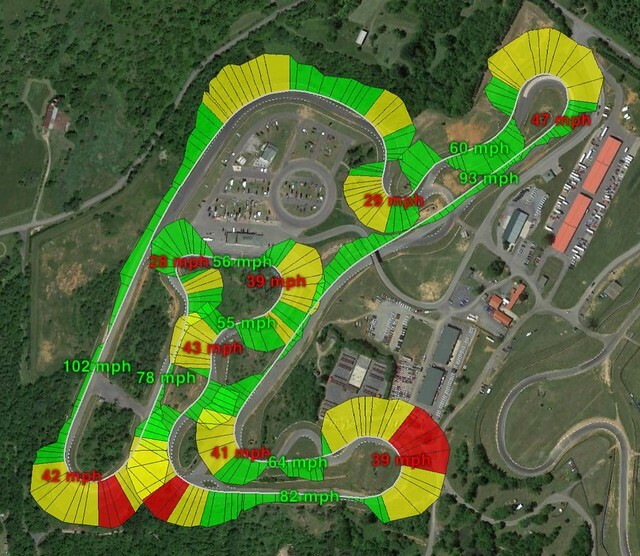 We can then overlay the 2:06 lap on the 2:04 lap to help see where we’re losing time. The data suggests our theoretical best time is closer to 1:59, even on street tires. 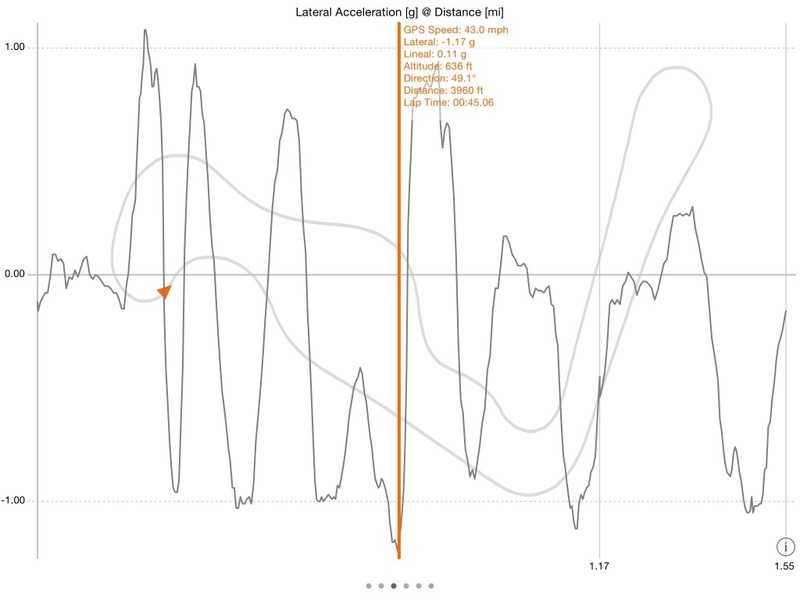 In HLT, the image is dynamic so you can drag your finger around the course and see the plots in the data, you can get a similar result using the HLT data export and looking at your laps in Google Earth. At Point B, the Stone House Straight, I carried a lot more speed into the Hook on the 2:04 lap. As the weekend progressed I gained confidence in braking later, resulting in the same apex speed, but the line exiting Turn 8 was much better in the 2:04 lap, resulting in higher apex speed at Turn 11 (Point C). That extra speed carried all the way to the entry of the Karussel, Point D. Through the Karussel and into the Karussel Esses, however, I actually had better speed on the 2:06 lap since I had a better exit from the banking. (You can see the slight movement to the inside of the Karuessel on the exit where I lost speed heading up the hill — red spike in the wrong direction). So what’s the take-away from this analysis? I can brake a little later and carry more speed into the apex of the Loop (A). Likewise, I can carry a bit more speed and brake later into the Hook (B), concentrating on getting a good launch out of Turn 9 (avoiding the curb on the inside) to carry more speed into Turn 11, carrying more speed at the exit (C) which will result in more speed at the end of the Bridge Straight leading to the entry of the Karussel (D). In other words: Brake later, brake less. Words to live by. When we look at the overall picture of traction on this course, we see our max performance summer tires are performing pretty well. We are pulling a maximum lateral load of 1.22 Gs in the tightest corner, Turn 7. The first chart shows our overall traction circle which is a little better than expected for a street tire. The second chart shows the maximum lateral loads on the corners. It’s also showing us the areas of the track that are unsettling the car. This is similar to the Speed chart that shows where we’re having trouble putting the power down. 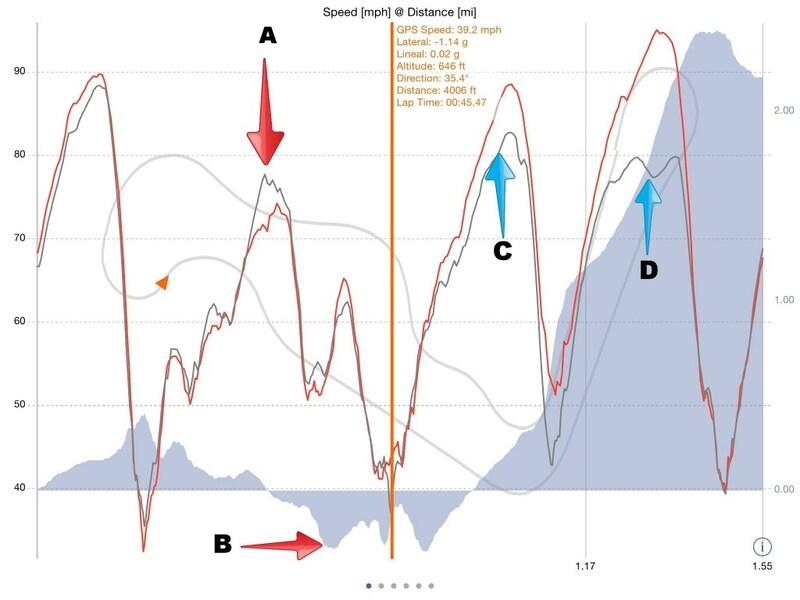 When we start looking at the Speed Chart we start to see areas where we’re having trouble making a clean transition back to full throttle at the apex of certain corners. When the peaks of the lines look like Vs, then it’s a smooth transition. Where you see Ws, then there’s a problem. 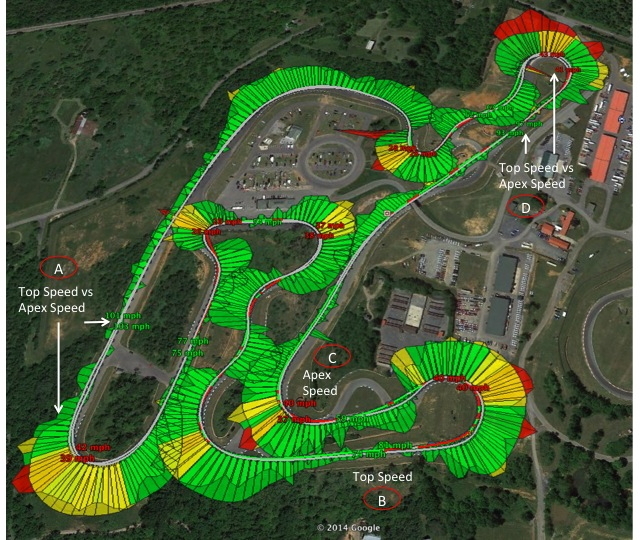 This chart is showing a comparison of two laps. The faster reference lap is in orange. The lap being studied is in gray. Until Turn 7 this lap was ahead of the reference lap. You can see the difference in speed at point A and the difference in time at Point B. But I over-cooked Turn 7 and by the time I was in the braking zone for Turn 11, was already behind. By the time I got to the end of the back straight (Point D), I had to lift and let another car pass. This just goes to reinforce the old adage of “slow in, fast out.” By being “fast in, slow out” of Turn 7, the rest of the lap was compromised. Google Earth hasn’t yet uploaded a new image of the circuit so the plot shows the path through open fields, but it is actually paved, just not well (more on that in a minute.) How to read this chart: Turn numbers are in circles. 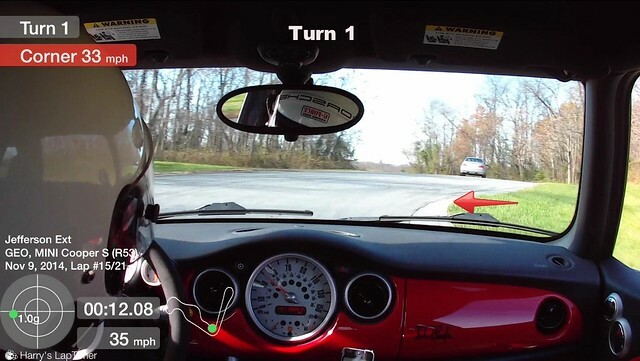 The color on the path of the car shows acceleration (green) or deceleration (red). Note that deceleration might just be lifting as in between 2 and 3 or the apex of 4 or 8. 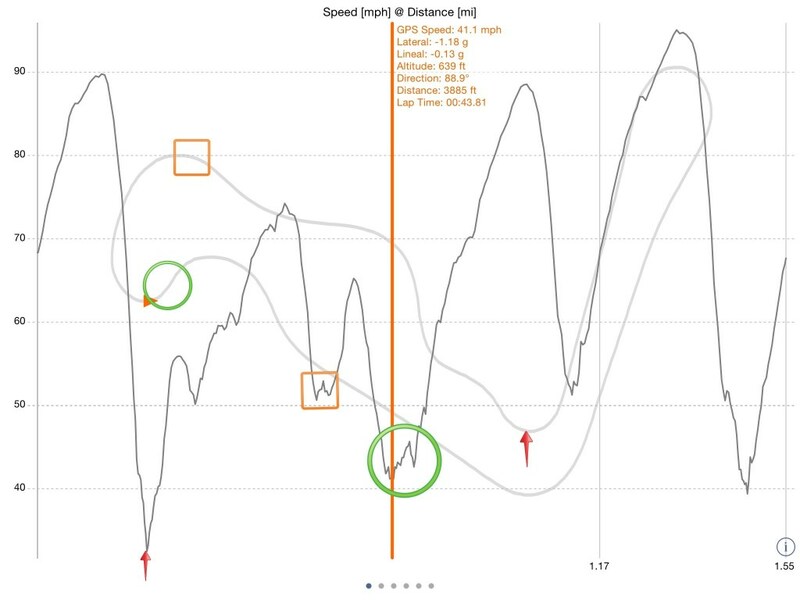 Green speed readings on the track show max speed before deceleration and red shows apex speed. The bars in each corner show relative lateral G load. Green bars are .4 to .8 Gs. Yellow bars are .8 to 1.1 Gs. Notice the lateral load where the new track rejoins the old track and in the middle of the back straight. There the car is going straight and the lateral load is from the unevenness of the surface. You see some of that on the front straight from 14 to 1 as you drive across the crown to set up for turn 1. Red arrows show apex visuals. If you already know the old Jeff, then jump down to Turn 4. 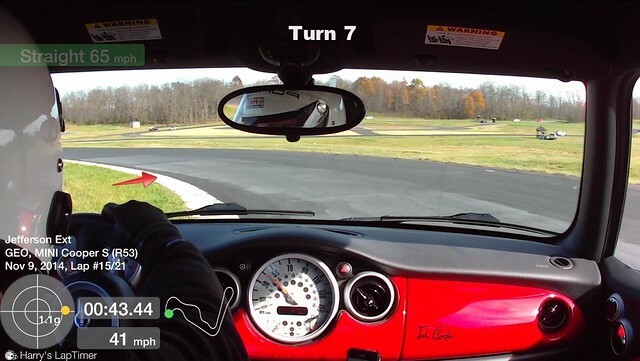 When you enter the track from pit-out, stay to the right all of the way to the apex of turn 1, otherwise, when at speed cross-over from right to left on the front straight and look down the track to the flagger’s bucket. RWD cars set up to the left for turn-in. The road is crowned so FWD will want to be more in the middle of the left half of the track or you’ll never get over the crown to the apex. The apex is very late and almost at the end of the curbing. You can ride the middle part of the curbing, but stay off of the end as it will unsettle the car. 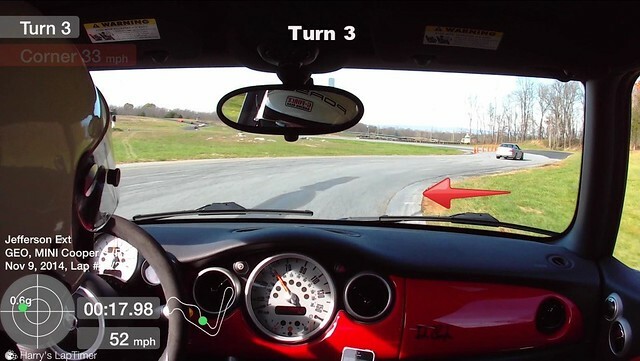 Stay to the right upon exit and let the car settle before turning-in to turn 2. Turn 2 and 3 should flow. If you’re early for 2, you’ll also be early for 3 so wait to turn in and make 2 a very late apex. Lift or tap the brakes to turn-in to 3. Turn 3 is one of the few corners where you can ride up on the curbs without unsettling the car. Apex is very late and carry as much speed as you can. 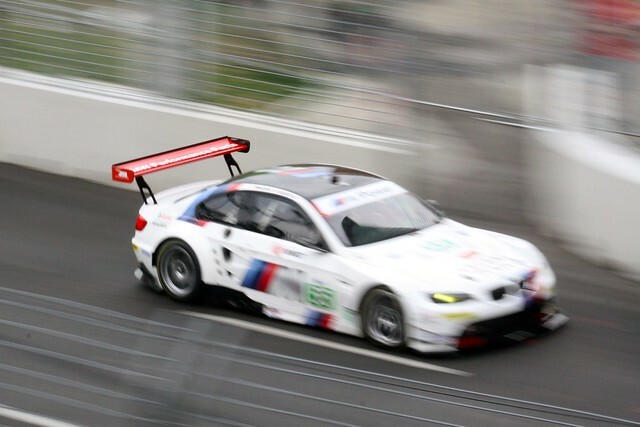 Don’t worry about track position on track-out as the entry to the next corner is rough and you’ll probably have to lift anyway to get back to the apex. Turn 4 is also a late apex. Ride the rumble strips and try to straighten 4 and 5 as much as possible. The exit to turn 5 is the roughest spot on the track. Point the car straight after the apex and brake in a straight line. Wait for the second bump before turning-in to turn 6. 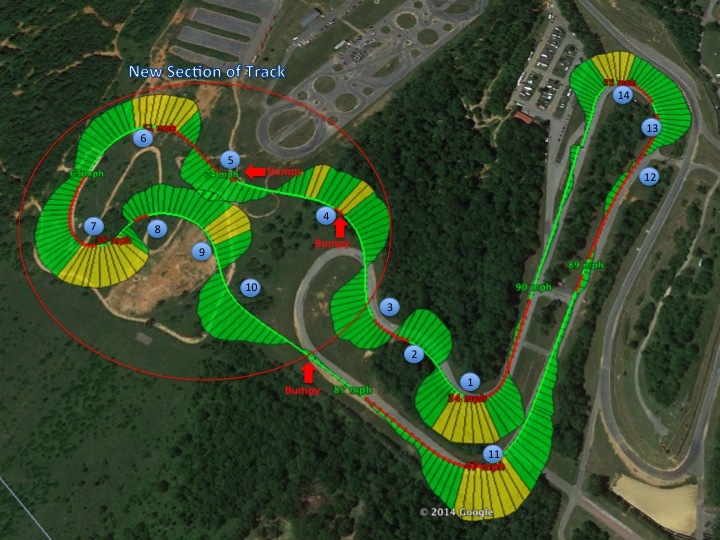 Set the car about a car-width from the curbing and late-apex turn 6 at the top of the hill. Open the wheel and let the car track out to set up for turn 7. Turn 7 is the most difficult corner on the track. You must be patient, especially when your tires are cold. It is a decreasing radius corner. Look for the path of the patch. Set your entry squarely in the middle of the patch and then pinch-off the apex. Trail-braking helps. 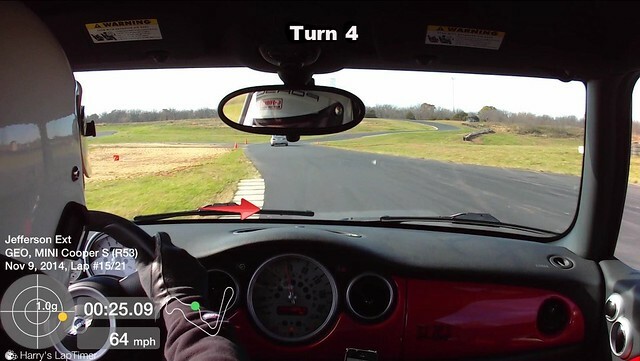 If you don’t sufficiently load the front-end, expect to under-steer through the apex and off the other side of the track. Track out to mid-track. Treat turns 8 and 9 as one double-apex corner. Do not track too far out in the middle as the pavement drop off is pretty severe. 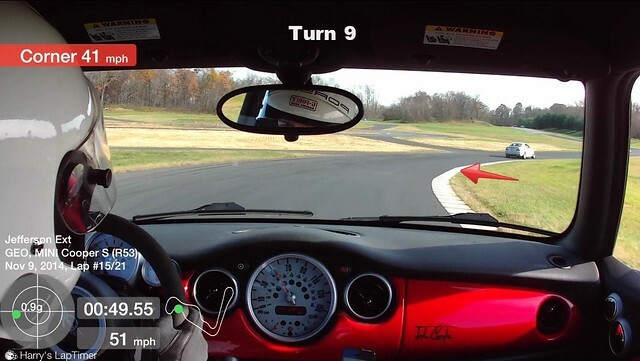 Ride the curbing on curves 8, 9, and 10. Late apex 10 but get on the power early to increase the length of the straight. The point where the new track joins the old is quite bumpy so stay away from the track edge. Stay 3 feed from the edge in the braking zone to 11 to avoid more bumps. Turn 11 will really hook up when done right. Release the brakes as soon as the car starts to turn-in and power through the exit using the full track width. Cross over from right to left to set up 12. Staying as far left as possible, turn in for 12 as soon as 12 and 13 line up and straight-line 12. Stay off of the curbing on 12 as it will really unsettle the car. Downshift and brake for 13 in a straight line. Some people are able to carry enough speed to brake once through 13 to set up turn 14. 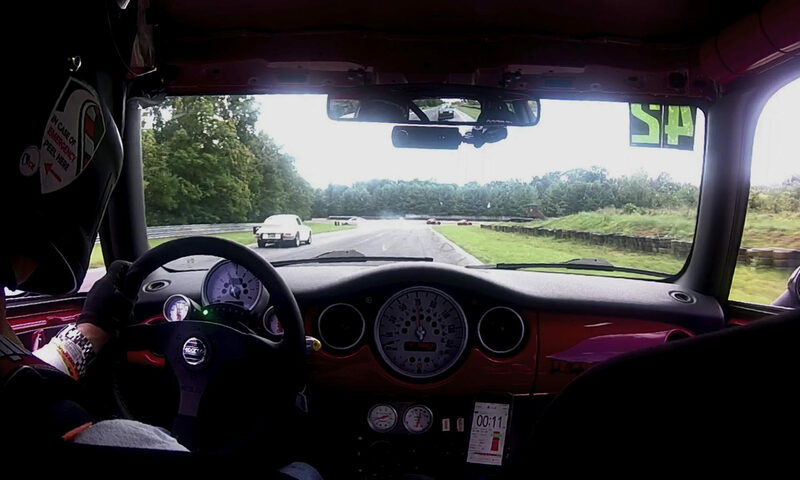 In the FWD MINI I have to release the brakes in 13 to get the car to rotate and can actually accelerate a little up the hill before turning-in for 14. RWD set up 14 by going as deep as possible for the entry. FWD don’t go too deep or you won’t be able to cross the crown to get back to the apex of 14. The apex of 14 is very late. Stay off of the curbing. If you are tracking out to the edge of the track before the pit-in lane, then your apex was early. Cross over from right to left and do it all again. I can tell you exactly when summer ended this year. It was at 3:23 PM on September 8th when this photo was taken. Friday at the track was hot and humid. Saturday was miserable, wet, and wonderful. And Sunday was a gorgeous autumn day. The inside even smells good. It smells like that brand-new baseball glove you got when you were a kid. The one you put a ball in and slept with it under your pillow to break it in. (OK maybe not everyone has that memory….) I took some video from my helmet cam as we lapped the course. I was fascinated by the speed of the gear changes and the great display graphics that emulate analog gauges. Unfortunately, you can’t see the gauges very well in the video. 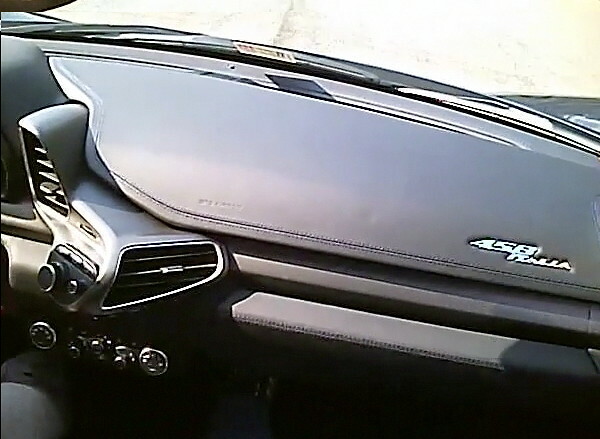 If you look just about 6 inches to the left of the “458 Italia” logo there’s a depression in the leather. It is sort of forehead shaped. That got me wondering about the survival rate of previous passengers. 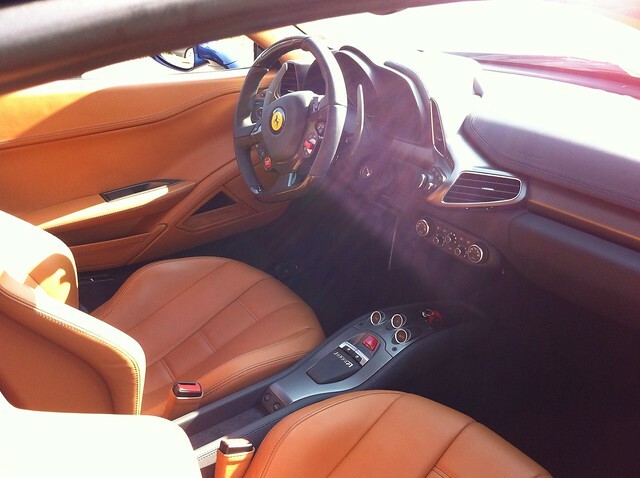 This car accelerates so quickly, just holding my head off of the headrest gave my core a workout. The GeorgeCo MINI powered by Beano was of course in action as well. In this photo, it’s powering through turn 7. The suspension work paid off and the car was very well balanced, level, and had tons of grip, even in the rain. The telemetry system is still a work on progress. The GPS is not very accurate with the iPhone in its current position so the track map is all over the place. (It looks like I’m taking a grand tour of Delaware.) The corner and straight speed indicators seem to be off too when you compare them to the large central speedo. G meter, throttle position, and RPM seem to be working, but the gear indicator doesn’t seem to go above 3rd. So there’s some work to be done, but the technology is cool. Fast forward to the session time of about 11:50 and again at 13:17 and you’ll see why we spend so much time on the skid pad in this program. In case you had $229 to $295K sitting around and were wondering what you would get for your money. The answer is at least 3 seconds a lap. That’s the difference in two laps chosen at random from my video of this past weekend. Both were on Friday as we refamiliarized ourselves with the track. 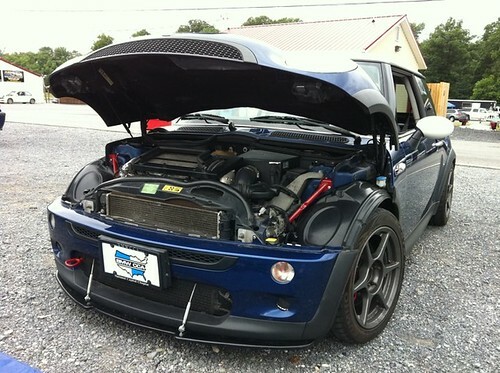 The only difference is that in my case, I’m pushing the MINI about as hard as I’m willing to go. There’s a little bit left, but not much. 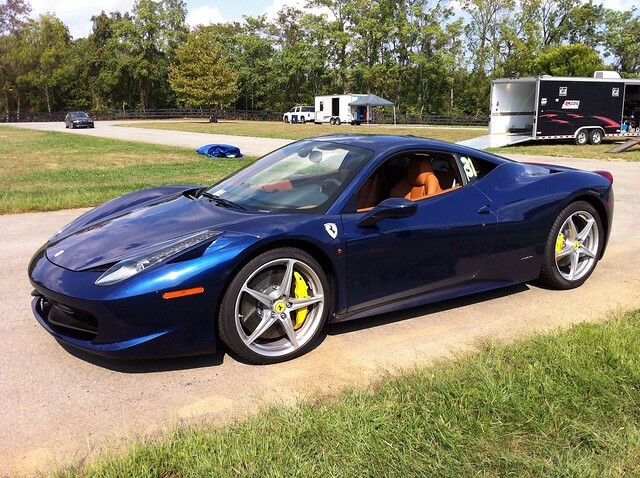 The Ferrari is going maybe 6/10ths on the straights. Alternately, you could take $13-$27K, buy yourself a low mileage 2006 MINI Cooper S, and buy a house with the rest. Just saying. Somebody must have hit the fast forward button on Autumn. 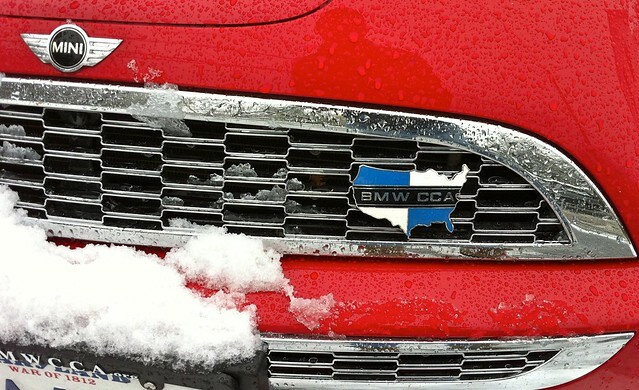 We had our first winter snow storm yesterday — much too early in the season. It was a great day to get caught up on watching movies, sorting photos, and editing videos. Much has been happening at GeorgeCo in the last three months. Let’s get caught up. At the end of the day, we even got to drive the track. (GeorgeCo thought he was in a traffic jam to leave. Much to his surprise, traffic turned left instead of right, and we found ourselves on the track.) Pratt Street was bumpy at parade-lap speed, I couldn’t imagine what it was like at 185 MPH. The beginning of October brought the final NCC BMW CCA Drivers’ School of the year. This time we were on the Jefferson Circuit. Rain turned most of the driving into one big skidpad exercise. But even at super low speeds with no grip, the Jefferson is tons of fun. Mid-day on the last day, the sun came out for a while and we got to take the new GeorgeCo MINI out for a spin. The video below shows the GeorgeCo MINI wearing regular old street tires, chasing down a certain Red M36. I still haven’t mastered getting the helmet-cam on straight, but this video is better than most. 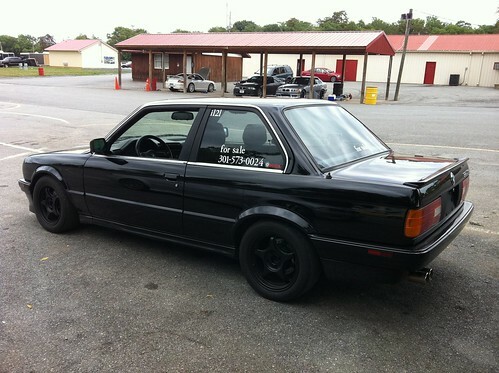 The big news of the month, however, has to be that the GeorgeCo E30 Powered by Beano has been sold. The buyer is an enthusiastic autocrosser who will give it a good home and the attention it deserves. Scuderia GeorgeCo has now gone from a high of five cars, down to a more reasonable three. After a bit of a summer break, GeorgeCo was back at the track with the National Capital Chapter of BMW Car Club of America to instruct for 3 days at the Summit Point Main Circuit August 5-7, 2011. 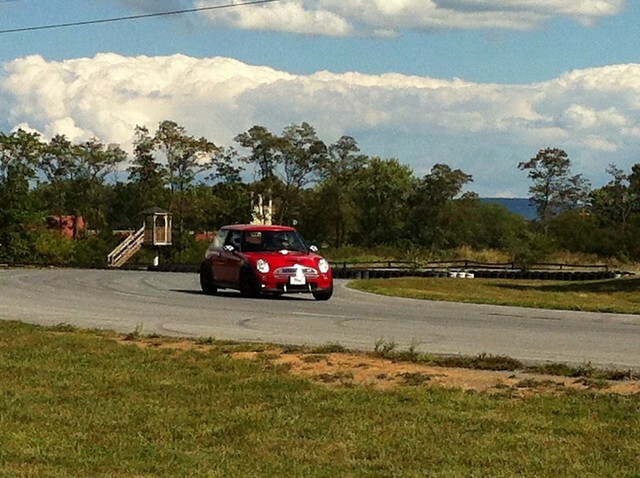 We ran the GeorgeCo E30 Powered by Beano on Friday and the GeorgeCo Blue MINI on Saturday and Sunday. I had two students this time out. 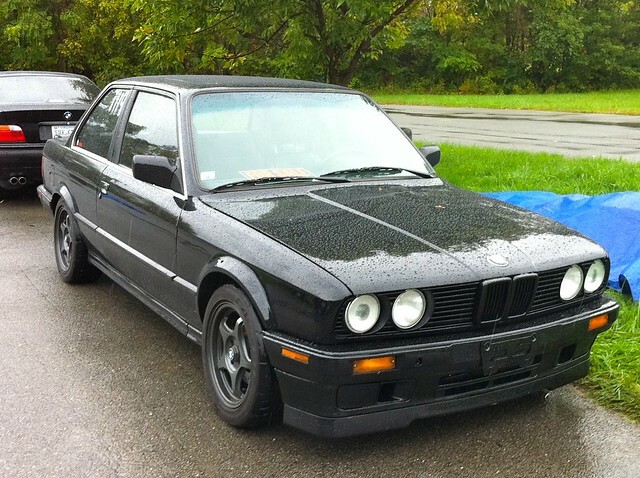 My A Group Student was in an E36 M3 and my B Group Student was in an E30 much like mine. Both accomplished GeorgeCo’s Objectives for any Drivers’ School: 1–Have fun. 2–Learn Something. 3–Return home with your ego and your car undamaged. 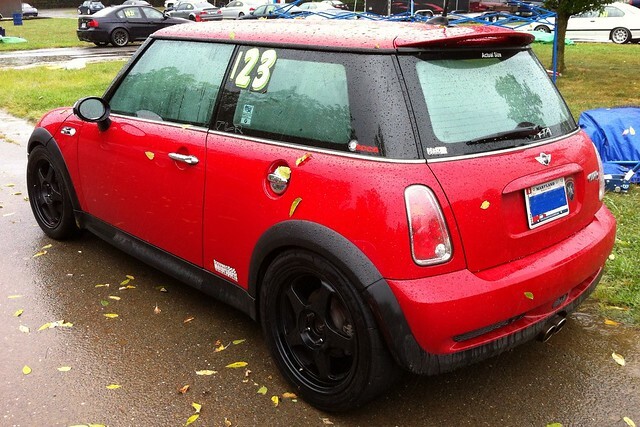 The MINI is sporting a couple of new mods designed to improve brake cooling and reduce flex under braking. For the brake cooling we took a trip to the local Ace Hardware to get some ducting. Having previously removed the fog lights from the bumper cover and cut a hole in the wheel liners, we connected the two with some ducting to improve air-flow behind the wheels. At the Shenandoah in similar weather in June we saw brake caliper temps in excess of 650 degrees. This weekend, temps stayed below 600. Tough to say if it was from the improved ducting or just the differences in the two tracks, but $15 for a little insurance is well worth it. To firm up the chassis you will notice the red convertible chassis braces in the photo above. Not seen is the lower stress brace that reinforces the link between the sub-frame and frame. This was on sale a few months back so we snapped one up. Install is dead easy and can be done in about 10 minutes. We got a break in the harsh summer weather we’ve been having here in the Mid-Atlantic and took full advantage of it with 3 glorious days at the track. We had a bit of rain on Saturday afternoon which spiced things up a bit as seen in this first video. But once we came to grips with the lack of traction on the transitions to the patches, lap times dropped down to within a couple of seconds of our times in the dry. After the rain, the track never had the same level of grip as it did on Friday, but it did give us a chance to try out a new camera angle with the GeorgeCo RePlayXD camera. 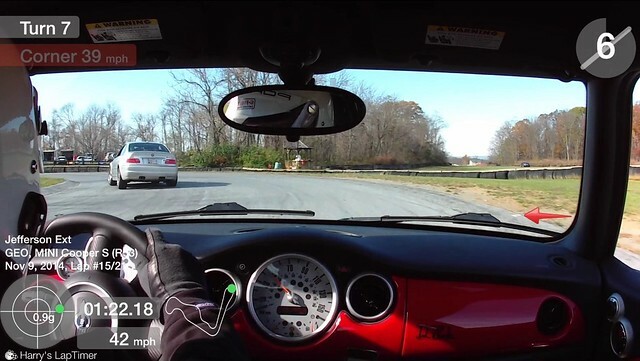 We’re also still perfecting the Helmet-cam, but this video gives you bit of an idea of what is meant by keeping your eyes ahead of your hands. Watch for the head to turn before the turn-in point in the corners.